This week, I have the pleasure of interviewing Dr. Stein, a cult survivor and renowned expert on cults and totalitarianism. 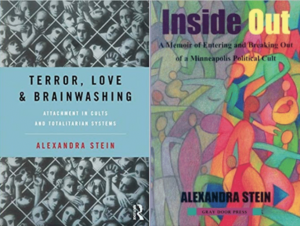 Alexandra Stein, Ph.D. is a writer and educator specializing in the social psychology of ideological extremism and other dangerous social relationships. She is an academic, having taught at the University of Minnesota, Birkbeck, and the University of London, now teaching at the Mary Ward Center. 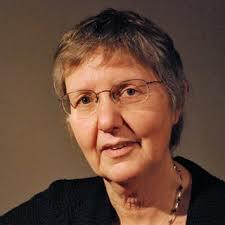 Dr. Stein is a Ph.D. sociologist and expert on social psychology. She teaches as an academic but gives talks, as well as, writes books. Her memoir Inside Out: A Memoir of Entering and Breaking Out of a Minneapolis Political Cult discusses her decade-long time in a political cult. More recently, her book Terror, Love and Brainwashing explains how almost anyone, given the right set of circumstances, can be radically manipulated to engage in otherwise incomprehensible and often dangerous acts. When I asked about her use of the word “love” in the title, she explained she meant “love” in the sense of phony “cult love” that new recruits do not realize is not based on true relationships. Dr. Stein believes that totalitarianism, in all of its different forms, is the second great risk that our world is facing. This would include at the micro-level, very intimate personal one-on-one relationships; at the middle level, groups; and the macro level, the kinds of threats and nations that we see such as North Korea that are suffocating under these totalitarian regimes along with the rising threats from around the world. Brainwashing and undue influence are not just a threat from religious groups but are concerning from the political stage, too. And, Dr. Stein prefers the use of the word “brainwashing” as many understand that term. She agrees with the “brainwashing hypothesis” of Benjamin Zablocki, with her focus being on the category of totalist organizations, of any size from totalitarian to cult to relationships. Her work, greatly influenced by Robert Jay Lifton, deals with what these types of relationships and organizations look like, along with how they operate. Dr. Stein goes into detail about the evolutionary-based attachment theory which looks at the physiology of how dynamic, assault leniency can affect cortisol levels, affecting processing in the brain; with the constant high cortisol levels and no way out, a person can dissociate under those conditions. Also, there is the trauma bond created from these types of relationships, which creates thought-stopping and blocks the brain from emotional processing, allowing a group or leader to manipulate the actions and behaviors of others, even to the extreme (such as with a suicide bomber). The group or leader wants the primary attachment of the person to be for the interests of the group and not of the individual. This leads to further isolation from friends and family. Lastly, Dr. Stein discusses President Donald Trump and how charismatic leaders of cults fit the profile of narcissistics, ending on the topic of how social media and the Internet can lead to a lack of community ties, making society very vulnerable.